Ill.by Dunker Tableau de Paris, 1786 ed. At the corner of this road, on a narrow stall, what do you suppose it is that I can see set out on mutilated plates? What are these scraps of food which are beginning to go mouldy? They are leftovers, collected up by lackeys after they have touched the mouth of some bishop who has decided on reflection to prefer a different morsel. They have been spurned by the kitchen boys and are destined to descend into the stomachs of the poor, who are as thin as the kitchen boys are fat. The latter have gathered them up willy-nilly and sold them to the regrattiers who now have them on display exposed to the air. Alas - who will make a stew of these? We know very well: they say a famished stomach has no ears; but it has eyes. Come the evening, some poor destitute, wrapped in an overcoat, will descend from his attic in order to buy these disgusting remnants that menials have slimed over. He will hide them and carry them off. He is a respectable man whom ill fortune has thrown into destitution; he is worse fed, worse accommodated, and less fortunate by far than a lackey. 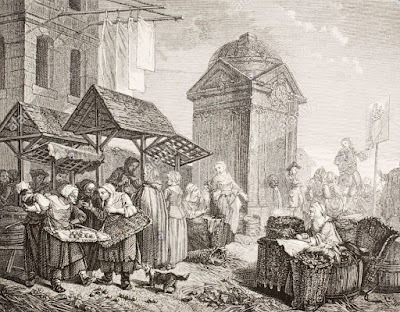 A charitable man, who fears his alms may be badly placed, should make a spy of himself at these stalls. He should keep watch by these cold and discoloured dishes, which could only tempt the starving. For certain, only the truly destitute will come thither in search of their miserable nourishment; these customers will be in need, and in real need. These leftovers, the very sight of which offends our sense of delicacy, might lose their vileness and serve as a touchstone to distinguish the truly starving. Giving correctly, is a true synonym for generosity. There is so much money spent on the streets of Paris! And among so many prodigious riches, how can we distinguish people who are truly generous? Let them wait in ambush near this leftover food which will be carried off in silent misery at twilight, and they will soon be moved and tender-hearted. 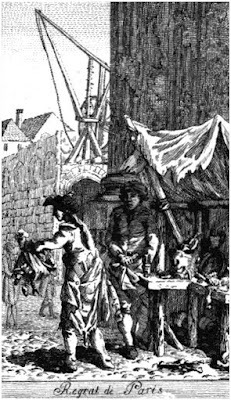 Regrattiers were marginal tradesmen who operated largely below the level of policing - and hence of historical record. As well as these purveyors of scraps from aristocratic tables, there were regrattiers of fruit, vegetables, eggs and of reclaimed salt. 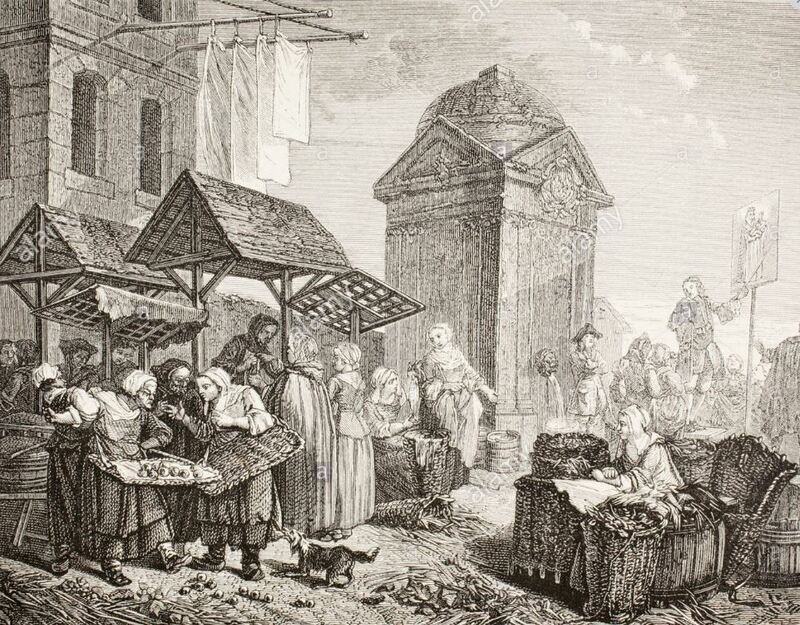 Only the salt trade was subject to detailed official regulation. An echo remains in the name "rue de Regrattiers" on the Île Saint-Louis. Legend has it that the island was built up from the smaller Îles aux Vaches and Notre-Dame by a regrattier made good; alas, it is not so; the street only acquired its present name in 1870. 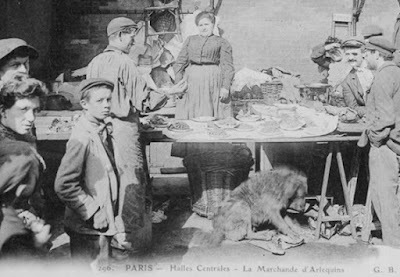 The profession lasted long after the 18th-century In the later 19th century the merchants - or rather their plates, which recalled those of circus clowns - were commonly known as "Arlequins"; see the formidable "Marchande d'Arlequins" in the postcard above. 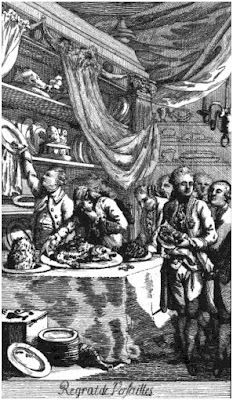 "Marchands d’arlequins : revendeurs de restes de repas des tables riches" La France pittoresque, 16.02.16. In Versailles, regrat is not at all revolting in this way. 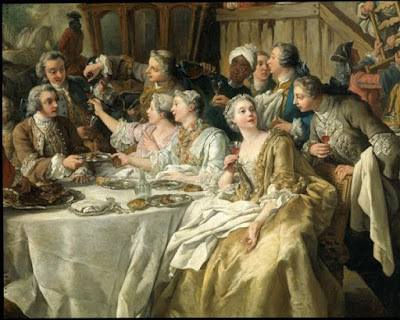 Dishes taken from the table of the King or that of the princes are still in one piece, and a bourgeois does not blush to consume them; besides, a morsel from the table of princes is reckoned a delicacy. A quarter of Versailles feeds itself on leftovers from the royal tables, and His Majesty's cooks have adapted their cooking to vulgar stomachs, not destined to receive the chef d-oeuvre of their culinary art. 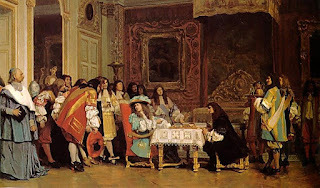 Immense fish, which no-one has touched, jump straight off the table of monsieur the comte d'Artois, onto that of some hat-maker, and will provide a good meal for his little family. They will eat succulent fare and have no need to do their own cooking. Thus in the town where the King lives; a certain officer wearing a medal, on his way to the minister, equips himself with a roast chicken that he wraps up nicely in a handkerchief. If he is invited to dinner, so much the better - his chicken will serve for his supper. given here is awesome...Thank you very much for this one. 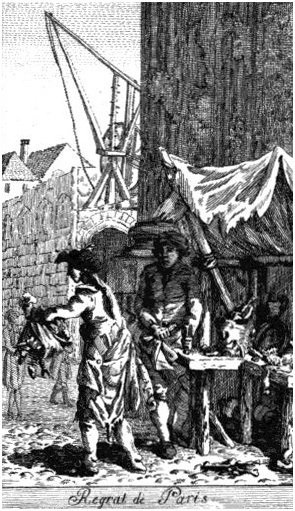 Jean Noël Hallé and the odours of Paris. A Frenchman considers the English "mob"